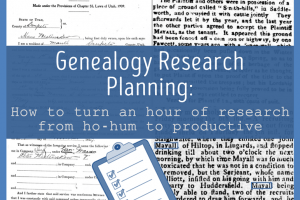 After an exciting and exhausting week at Brigham Young University’s Conference on Family History & Genealogy, it’s time to digest all of the information swimming around in my head. Nicole and I attended the conference as official bloggers and met people from all over the country who share our passion for finding their family. Four days, three keynote addresses and nineteen classes later, what did I learn? Keep reading and I’ll fill you in! A conference would not be complete without the vendors and this was no exception. 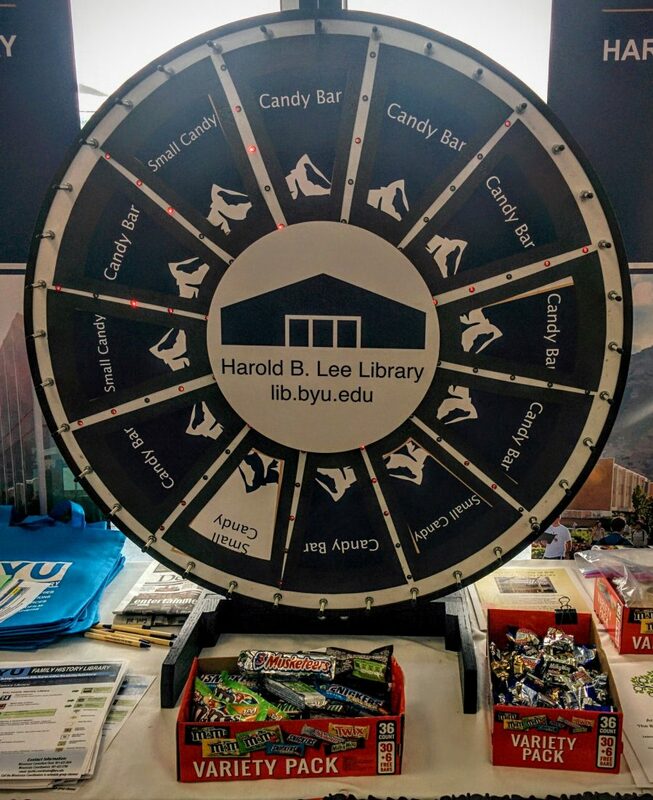 I collected their flyers, talked with them about their products, and spun the BYU wheel every day. Sponsored by the BYU Family History Library, this was my source for candy! I’ve researched at the library many times and marvel at the great collection they have amassed. The website has links to free webinars, digital state archives, maps, newspapers, and so much more. If you haven’t yet discovered this resource, take some time to explore. You won’t be sorry! My favorite holding at the BYU Harold B. Lee Library is my Great, great grandfather William Henry Kelsey’s diary housed in the special collections department. I wrote about how I located it several months ago. 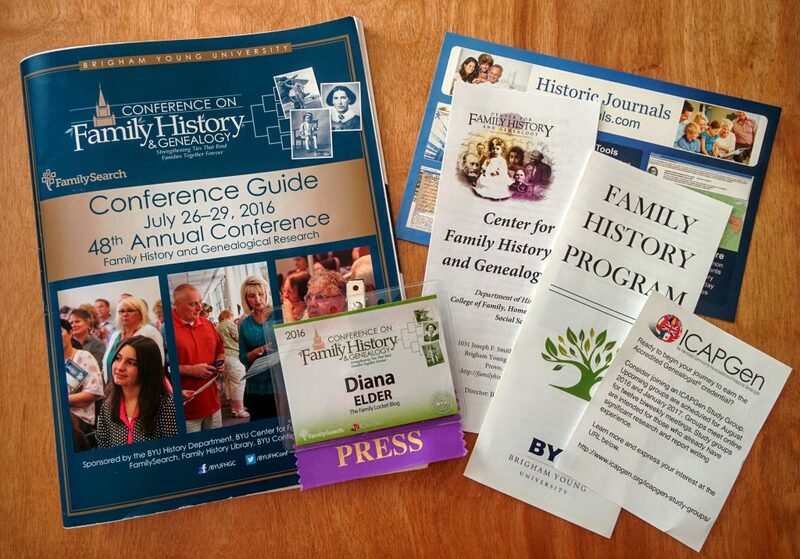 Did you know about The Center for Family History and Genealogy at Brigham Young University? Located in a different building than the library, the center employs about 40 students who conduct research, supervise projects, and more. My daughter, Elizabeth, met her husband while working here as a student! They worked on the Immigrant Ancestors Project, indexing difficult to read passenger lists, and other emigrant records. Check it out, you may find your ancestor! I attended this track of classes at the 2015 Conference, which helped put me on the path to accreditation. Since I am in the midst of of my four-generation project and looking to test in the next six months, I decided a refresher course was in order. One of the best parts of this class was reconnecting with friends also in the accreditation process. 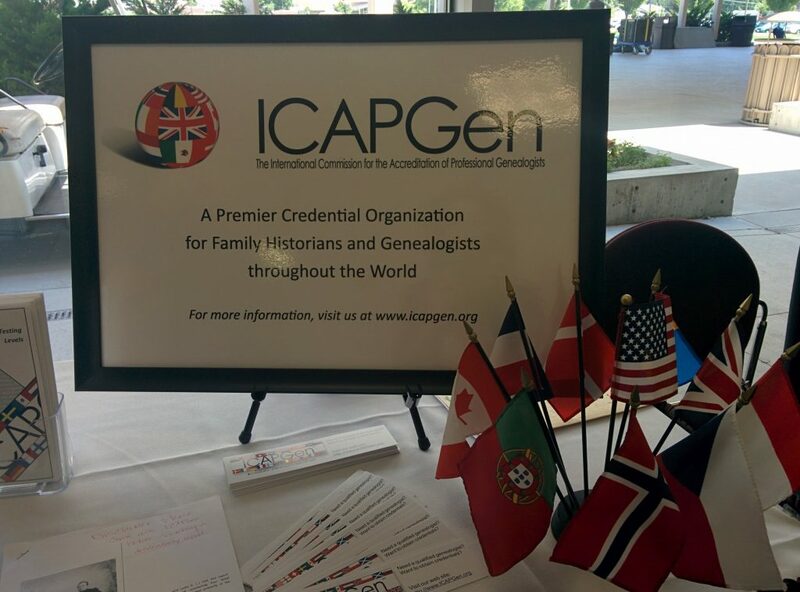 Throughout the week and at the ICAPGen luncheon on Friday I visited with several Accredited Genealogists (AG’s). I asked them about their journeys and without exception, each told of how accreditation had opened up many possibilities to them. 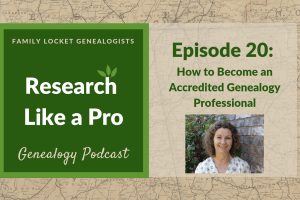 The positive vibe really reinforced my desire and decision to become an Accredited Genealogist. If you have an inclination to become accredited, the BYU Conference is a great way to learn all about the process, meet others who are interested, and ask all of your questions. The website features a new publication, “Guide to applying for an AG Credential.” You can download it for free and print it out for easy reference. 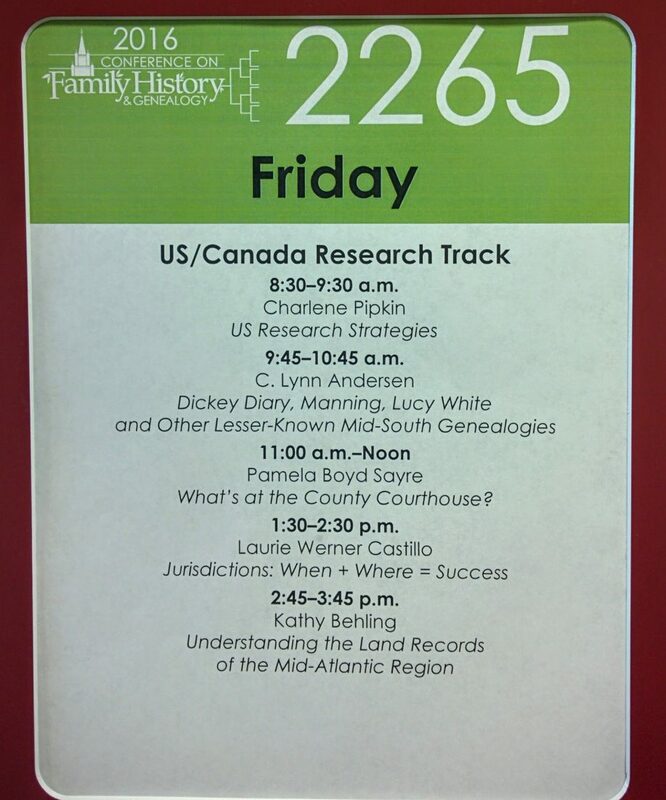 The conference offered several tracks of classes: British Isles Research, DNA Research, FamilySearch, Church Records, Basic Records, Beginner, Genealogy & The Law, German Research, ICAPGen, International Research, LDS Ancestral Research, Methodology, Military Records, Online Research, Preserving & Sharing Family History, Scandinavian Research, Technology & Tools, Unique or Unusual Records, U.S. and Canada Research, Utah Libraries & Archives, and Ward Family History Consultants. I was only able to attend a fraction of classes offered, so I chose carefully. Thankfully the syllabus has valuable information from the classes I missed. I’ll be trying out the research tips I learned and writing more in the future, so stay tuned. For now, here are notes from three of my favorite classes. Loretta Luce Evans, AG, taught “Creating a Case from Circumstantial Evidence.” To break through our brick walls, we generally need to use circumstantial or indirect evidence. -Re-read documents for any information we may have overlooked. -Look for clues in those documents to other records we can search. 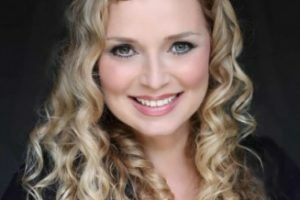 -Do the math – do dates add up? Analyze each relationship and fact paying attention to age. -Create a chart, a timeline, or a spreadsheet for complicated problems. -Using circumstantial evidence is like a logic puzzle. Fit the pieces together and you can break through a brick wall in your research. -I can’t wait to put these steps to the test with some of my brick walls! Pamela Boyer Sayre, CG, taught “Social Security Sleuthing.” The SS-5: Application for Social Security Number contains valuable genealogical information: women’s maiden names, date and place of birth, parent’s full names (including mother’s maiden name) and details of residence and employment. You can request a copy of the this application for a fee of $27.oo if you know the Social Security number and $29.oo if you don’t. Ask for a microprint of the microfilmed original and mail in the request with proof of death of the parents (death certificate, obituary, newspaper article, or police report). Important to know that if you don’t include death information for the parents, theirs names will be redacted (crossed out) unless they were born 120 years ago or the individual you are requesting is 100 years old. I haven’t yet sent for an SS-5, but I’m intrigued by the possibilities. Jill Morelli’s class “Using the Non-Population Schedule for Context & Evidence” gave me many new research possibilities. Keep in mind that not all schedules are available for each state, but it’s worth checking into. You might find something interesting. -Agriculture Schedules: Compare the land value of your ancestor to his neighbors; learn what crops he raised; track the value of his land each decade. Available 1850, 1860, 1870, and 1880. -Manufacturing/Industry Schedules: Your ancestor could show up if he was running a business out of his home; can help you track the context of your family, show what was in the community. Available for 1820, 1850, 1860, 187o, and 1880. -Community Information: Learn about the churches, public improvements, schools, average wages and more for the location your ancestor lived. Available for 1850, 1860, 1870, and 1880. -Mortality Schedules: 10% of the population is listed here, but that is still 10%. This schedule lists those individuals who died in the 12 months prior to the census. You might find family members listed no where else. Available for 1850, 1860, 1870, and 1880. -Delinquents, Dependents & Defective Classes (DDD): This information is cross-referenced on the population schedule. If you see a check mark in this column on the population schedule, check the DDD special schedule for more information on an individual. Conducted only in 1880. NARA: Provides an overview of non-population censuses and also, if you scroll to the bottom, a table that records which state has which schedule. U.S. Department of Agriculture: Totals of agriculture schedule information by state. U.S., Selected Federal Census Non-Population Schedules, 1850-1880 on Ancestry.com: You can search by name or use the options on the right to select your state, schedule type, year, and county. Interested in attending the BYU Conference on Family History & Genealogy in 2017? Mark your calendar for July 25-July 28 2017.